Home / News + Resources / What is Youth Work? In early 2009 YANQ began a major youth sector workforce development project. This project was designed to develop a sustainable and vibrant youth sector workforce in Queensland, which protects and promotes young people's rights. The Murri Youth Sector in Queensland report outlines the conduct and findings of a significant research project undertaken with Murri youth services in three parts of Queensland. It presents a summary of themes and draws attention to some of the possibilities for future actions and research that have emerged from an evidence base that has not previously been documented on the profi le and demographics of this sector. This report, The Youth Sector in Queensland (PDF), outlines the conduct and findings of two significant research projects undertaken with youth services in Queensland. It presents a summary of themes and possibilities for future actions and research that have emerged from an evidence base that has not previously been documented on the profile and demographics of the youth sector in Queensland. The Youth Services Workforce Skilling and Training project explored workforce development issues and topics with the Department of Communities and Reconnect funded youth services workforce in south west and south east Queensland. The report also contains interim data generated from the Aboriginal and Torres Strait Islander Youth Sector Skilling and Training project in Central, North West, Brisbane and Cherbourg areas of Queensland has also been included. Before we can promote the sector, it is essential to know what we are promoting – that is, to have a clear definition of youth work and its place in the youth (services) sector. 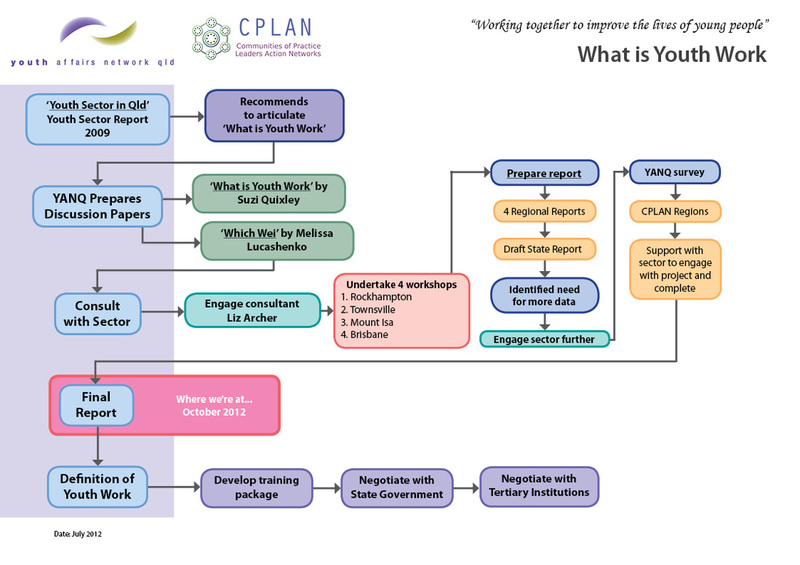 Together, this process enabled and enriched 12 months of sector-wide discussion and debate – leading to creation of a working definition of what youth work is and who the youth sector represents. The chart below shows our journey.